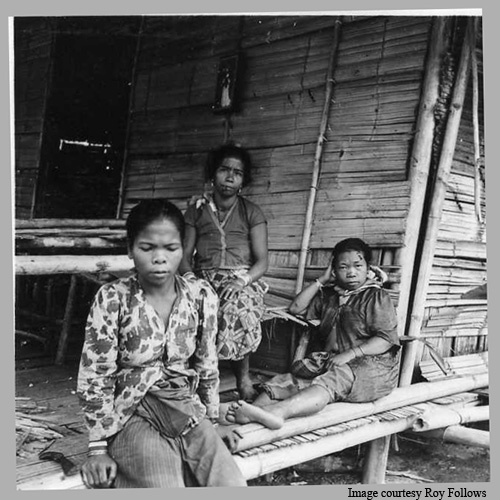 We continue this fascinating and evocative account of Roy Follows and his Malay Police Platoon deep in Communist Terrorist jungle country during the Emergency - in and around defensive position called Fort Brooke. The images are something esle! Can you smell the jungle? Let me tell you ssomething about the documents that I received via AD from the Dept of Aborigines - I still have some of those documents. I had been left to my own devices when setting up Fort Brooke, muddling through to the best of my ability, particularly as to how to approach and treat the local inhabitants - little known jungle folk - a job which anthropologists could only dream about. After a few weeks of being in the fort, I received documents, written by an 'expert', entitled 'How to Handle Aborigines'. 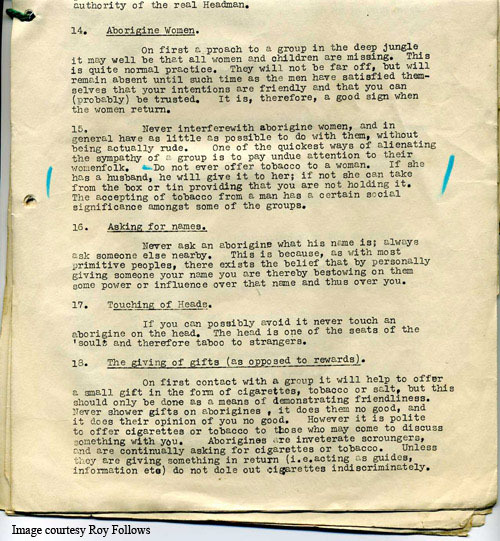 Going through these 'DIY' papers , I noticed a paragraph 'Aborigine Women' (see photo below) where one sentence stated: 'Do not ever offer tobacco to a women.' It went on ' The accepting of tobacco from a man has a certain social significance amongst some groups'. Oh dear! I've never smoked (a rarity in those days) but I always had a tin of cigarettes in my shack and, when visiting ladangs, I would hand out fags to both men and women. Ignoring the 'experts' advice, I continued giving cigarettes to the aborigine ladies. Although I conjured up in my mind all kinds of unpleasant results that could lay behind the words 'A certain social significance'. I never did find out what the consequences were! Meet the Ladies, on the veranda my shack. Aborigine women with child, outside my shack. 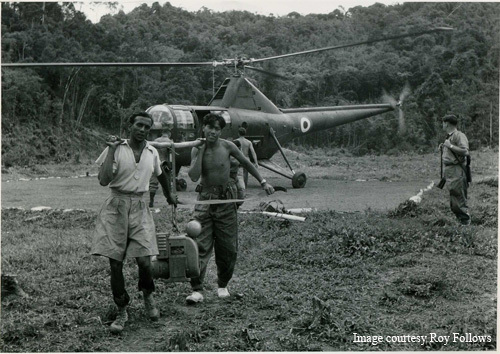 This next part of Roy's story talks about the helicopter support needed to keep Fort Brooke supplied with essentials ... and some non-essentials! 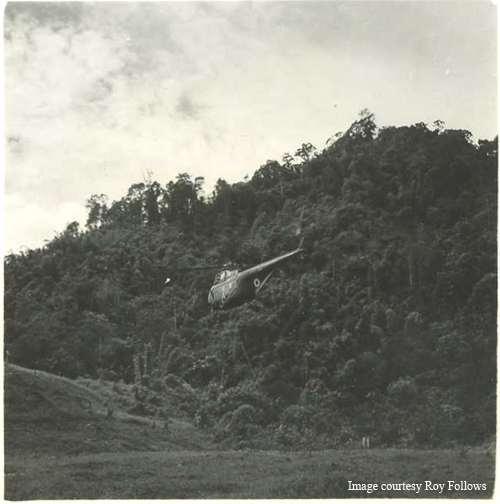 Helicopters… I would always be alerted by radio of a helicopter’s ETA, reason for visit, and who the passenger/s were, then, on hearing its approach I would go to the LZ near Fort Brooke and guide it down. Closeup of Heli pilot - Pontius Pilate. Can anyone identify these helicopter types? They certainly can! Our thanks to John Cooper and Laurie Bean for ID'ing the aircraft on this and other pages. Not only that, Laurie can identify the Squadron! This one is a Bristol Sycamore HR14 from 194 Squadron. 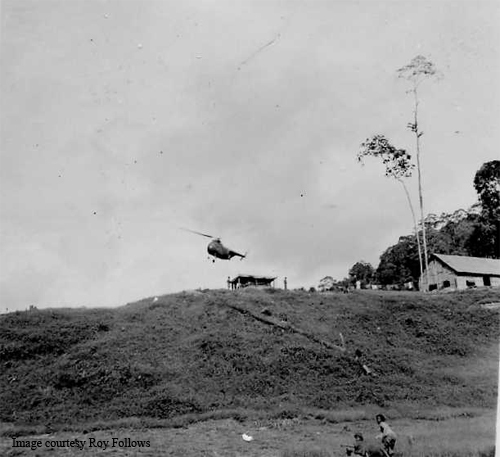 Close to the river, away from the fort buildings, was the aviation fuel store made out of bamboo. 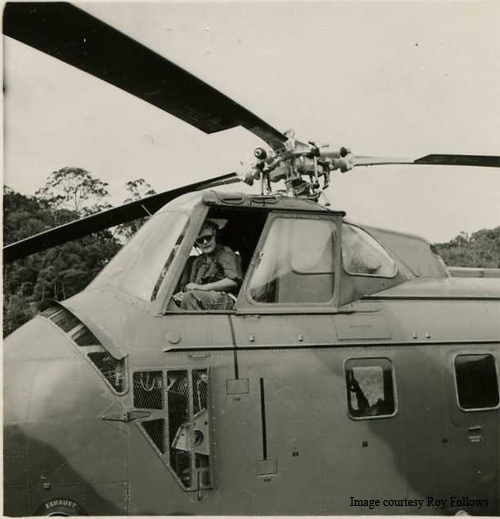 The avgas was in five gallon tins ('Flimsies’, opened with a parang) and, to make sure helicopters could always rely on a 'fill up,' I had to keep the number of tins available at above a certain amount. Sometimes the shack would be packed high with tins of avgas - an inferno waiting to happen - which would be brought in by helicopter. 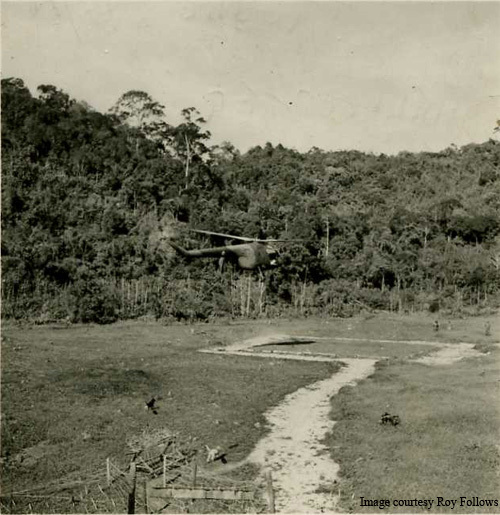 Whirlwind Helicopters on the LZ. The small hut on the right is the Avgas store. If a big operation was being mounted, large S55 helicopters of the Royal Navy would ferry in British, Gurkha, or Malaysian troops who, when assembled, would strike off into the jungle. 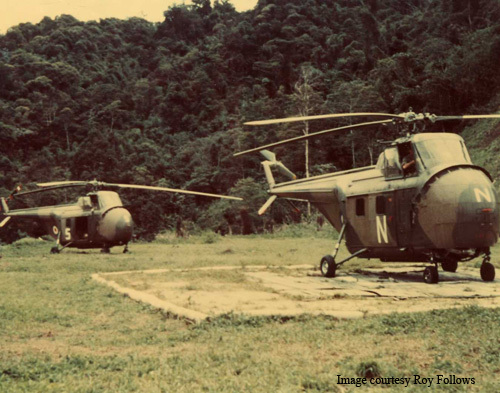 Smaller RAF helicopters would bring supplies, but occasionally and at the waste of precious avgas, they would fly in for a fleeting visit the “I've been to Fort Brooke”-type visitors before heading back to KL in time for the cocktail circuit. Helicopters S55s or S51s? (Can anyone identify the aircraft type?). Laurie says this is a Whirlwind, possibly HAR2/4. This looks to be a closer view of the aircraft in Photo 4. From the colour scheme, they could be RN, 848 NAS. At the time, a lady was the Assistant Director of the Dept of Aborigines (a decent sort, but a nuisance) who made what she thought would be a quick visit to the Fort. When the helicopter touched down it was a perfect day, but three hours later when she was just about to return to KL and the fort became shrouded in mist. It was so bad that the pilot would not risk taking off, which meant they had to stay the night. The helicopter’s two man crew bedded down in my shack on a pile of parachutes, and the lady was given the spare camp bed along with a couple of blankets. 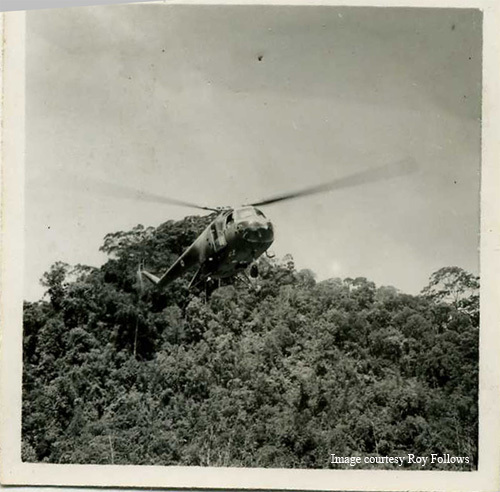 The next morning, and in a bright sunshine, the helicopter lifted off for KL. Roy seeing off the lady who went away with an unexpected present! (Whirlwind HAR4, 155 Squadron - Crewman on left). About three weeks later, and having heard from a couple of reliable sources, I was in Fort Brooke creased up with laughter. The lady from the Department of Aborigines had taken a present back with her - she had arrived home carrying fleas/lice. They were with me on most days because of the Aborigines in my shack. No matter who you were, there was no escape from lice and fleas in ' Fort Brooke'. 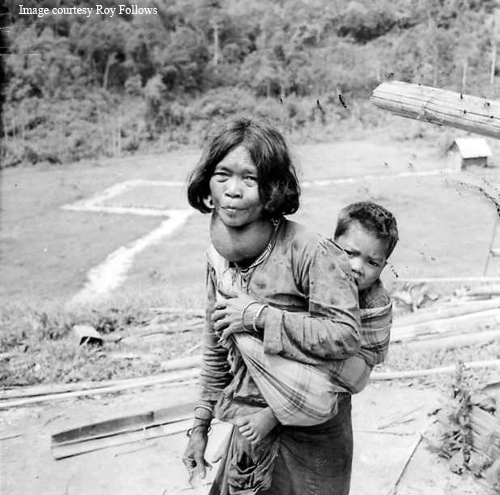 To show what little knowledge she had about these jungle folk, in the hope of getting the Aborigines to take an interest in their personal hygiene, shortly after her visit she had boxes of the best scented soap air-dropped into the fort! The Aborigines had never seen or used soap before, but there was an instruction with the consignment telling me that I was to explain to them what it was for and to show them of how to use it - honest! Whirlwind HAR2 (? ), 848 NAS. Roy: "Here a crewman and myself were photographing each other at the same time." Laurie Bean comments: "Whirlwind HAR4, 155 Sqn. I have been trying to read the serial on the tail boom. It looks like XD184, which was a 155 Sqn aircraft. If so, I flew in this helicopter in 1974, whilst it was on the strength of 84 Sqn at Akrotiri, Cyprus. It was displayed at the main entrance to Akrotiri in 88 when I went back there. Not sure if it still is on display." Another shot of a helicopter and pilot. Laurie Bean comments: Whirlwind HAR2, 848 NAS. Could be the same aircraft as in the previous photo. Both have the code 'A' on the side. 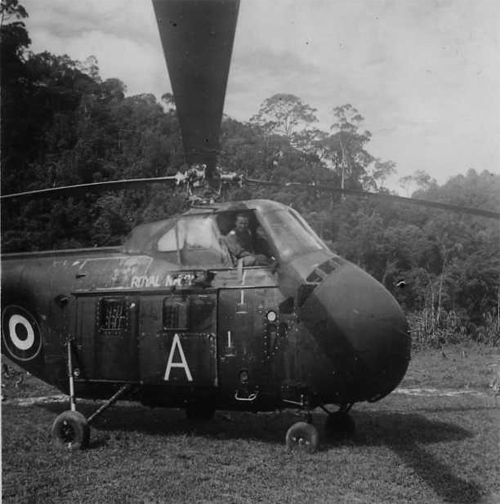 Sikorsky S51 Dragonfly, 194 Sqn, Helicopter with crew member standing by brings in new petrol generator for the Radio Transceiver. Could be a Sycamore? Some one will know. They did! 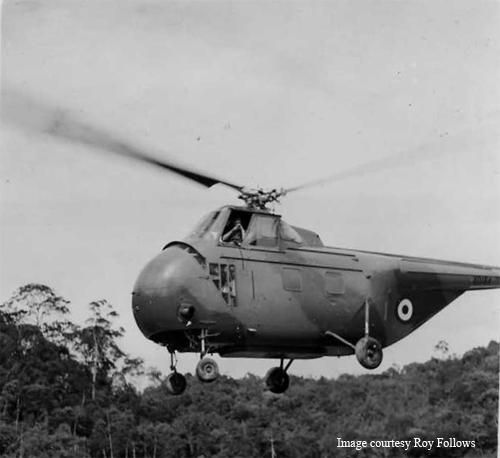 Both John Cooper and Laurie ID'd the helicopter as a Bristol Sycamore. Laurie added "194 Squadron". "They are excellent pics Roy and just by way of interest my old Squadron 209 of Short Sunderland Flying Boats fame when reformed took ownership of Scottish Aviation Single and Twin Pioneer aircraft, there is one excellent example at The Cosford Aviation Museum in Shropshire brought to my attention by Laurie. 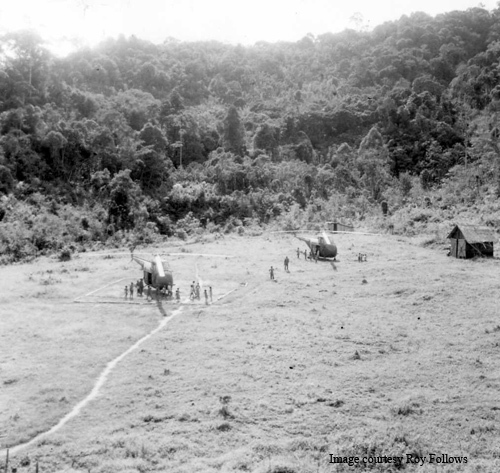 These aircraft could land in minimal space in jungle clearings, in fact a curtain call of The Single Pin was to take-off ACROSS the WIDTH of a normal runway. I'm sure some of you guys worked on/with these or even flew in them, the latter was an unforgettable experience, I can't say the same for the oil leaks though, aarrrggggghhhhh!" "The Whirlwinds of 155 Sqn had only recently been delivered during Sep/Oct 54, hence their 'newish' appearance. Many thanks to Roy for supplying these photos. They certainly provide a rare insight into jungle ops by these units. And, having read Roy's book, 'Jungle Beat', I can recomend it to anyone as a very good read. I couldn't agree more! And our thanks to Laurie and John Cooper for their help on these photographs. We received anything between twenty to thirty supply parachutes during an airdrop, and often it would take two Valettas to deliver them. With this amount parachutes arriving weekly in the fort, we had to find a way to return them to Air Supplies KL. 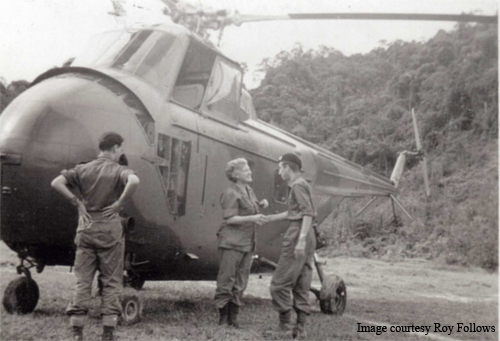 Although the pilots of visiting helicopters would always take a few out if they had room, this hardly made a dent in the amount that would soon pile up. 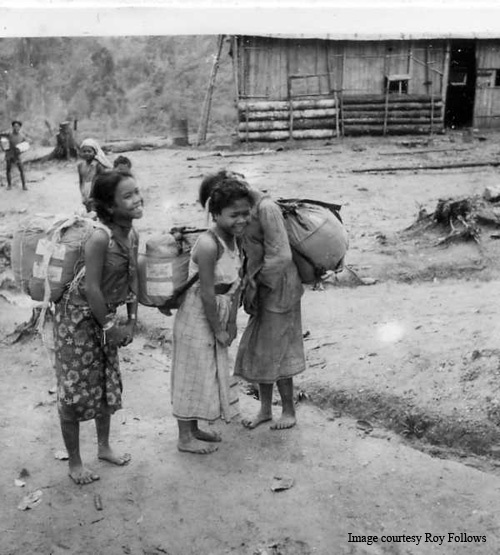 To get rid of about eighty or more, I arranged with a couple of local headmen for their people to carry one each to the nearest Jeep track. A couple of photographs follow. 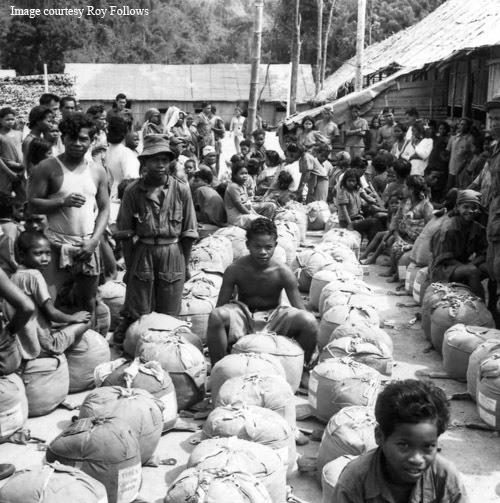 They are of Aborigines assembled in the fort - a sort of chaos - before setting off with the parachutes. 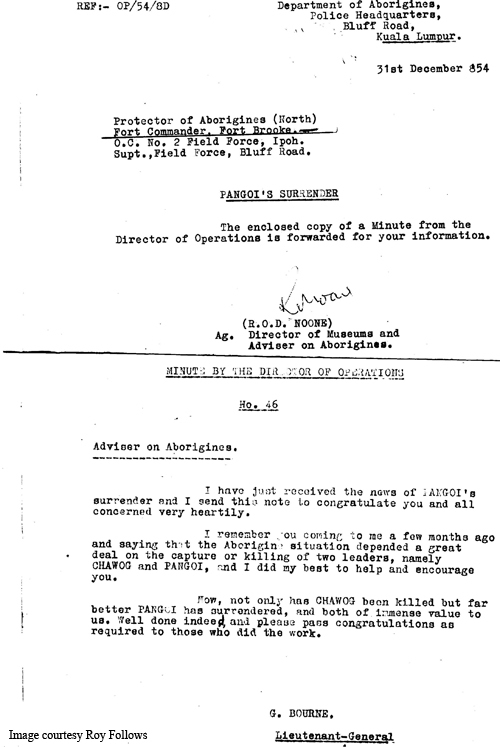 Fort Brooke Organising Aboriginesto carry out parachutes. Even the young ones help. Now Helicopters Fort Brooke. 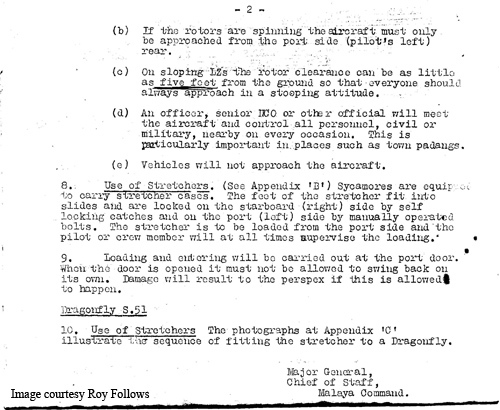 Note from General Bourne congratulating ALL those who persuaded Pangoi to throw in the towel. Strange I don't recall seeing any of the others in Fort Brooke! I received this next photograph from a police friend of mine a couple of years ago. Sadly he passed on shortly after sending it to me. It's an official photograph taken by some government dept photographer. This photograph was taken in Fort Brooke some six months or more after I had departed. 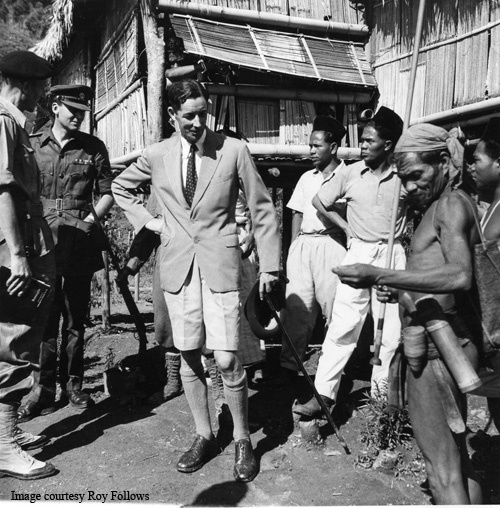 It shows Sir Donald MacGillivary, The High Commissioner (he took over from General Templer) together with his flunkies, meeting the notorious Pangoi. This photograph shows how much Pangio was rated.